Best seat in the house is orange! 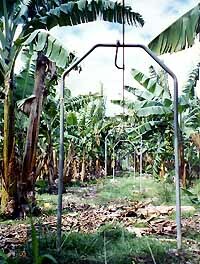 Banana plantations in many tropical countries use an interesting monorail system to haul the bunches of fruit from field to packing shed without damage, suspended on the same principle as sides of beef are moved around butcher shops. Similar systems have begun to spread to large-scale flower nurseries and other types of plantations. These monorails have proved Sir Arthur Heywood was wrong! The narrowest practical width of track usable by locomotives for agricultural haulage is now an 11 mm monorail, not fifteen inches. Of course, in his days steel manufacture was in its infancy, and long wires capable of withstanding tensions up to 10,000 pounds could not be made. High tensile steel wires of 7/16 inch (11mm) diameter are suspended seven feet (2 m 10) off the ground, firmly anchored to steel posts at each end, drawn rigid by hydraulic pumps, and fixed into place by concentric wedges. To prevent sagging, the wires are hung from arches every ten yards or so. The cargo is suspended by hooks from rollers, the latter are linked together by steel rods to form trains. The main freight is fruit, but farm chemicals and construction materials are also carried. Passengers are usually prohibited for insurance reasons, but can be carried on seats suspended from the rollers. The farms are served by a network of arrow-straight parallel wires, arranged so that no part of the farm is more than about fifty yards from a wire. 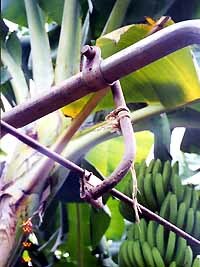 These branches are linked to the packing shed by main or collector wires, usually perpendicular to the laterals. The rollers move from the lateral feeders to the main collector over curves made of 11mm by 50 mm flat steel bars with rounded edges to match the wires, also suspended from arches. Points are formed of steel bar, ending in a saddle-shaped clip so that the rollers pass off the curve onto the straight wires without derailing. The rights of way of the monorails are about a meter wide. Level crossings over farm roads are essentially gates that swing laterally, carrying the rollers on a long piece of the same kind of steel bar used for the curves. Bridges are simply a wire over the gap, usually with a plank footpath underneath since the cable rights of way are used as farm paths. Very long gaps are bridged with cables having catenary suspension. Bunches of fruit are hand-hauled to the main cables. On small farms, a man hauls twenty bunches weighing about a half a ton in all to the pack house. On larger farms, longer trains of up to a hundred bunches are formed. Originally they were hauled to the processing facility by a small four-wheeled farm tractor, or sometimes a horse, but the need to maintain paved roads and waterway crossings for them made an alternative essential. Nowadays almost all systems use little diesel-hydraulic tractors, suspended from two bogies, capable of hauling up to three tonnes along the wires. Built by several makers, the essentials are common to all. Six horsepower motors drive a hydraulic pump, and the direction of the oil flow is controlled by an internal swash plate. No gears or reversing valves required. Each pump drives two small turbines, each of which powers a chain final drive to two plastic-tiered grooved wheels on each bogie. 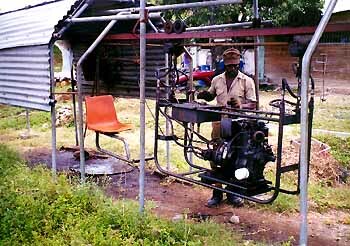 A driver sits on a chair suspended behind the tractor, and controls the direction, speed, and braking by a single lever connected to the axis of the swash plate. These monorail systems originated about thirty years ago, and there are several thousand kilometers of them installed in plantations all through the humid tropics, in at least fourteen countries. Several hundred of the locomotives exist. To my knowledge they have never been written up in the technical press. Thank you Richard for sharing your paper and photographs with us. Obviously monorails can serve in all types of interesting capacities!